You may have heard of – or even used – Runtopia in the past for its workout app or GPS tech, but the company is now stepping into the world of running watches for the first time. The Runtopia S1 is the company's first wrist-based tracker, and it looks like a basic yet affordable running watch. You're able to buy the Runtopia S1 in the US now for $99, but the company has yet to announce when it'll come to the UK or Australia. We know a UK launch is on the cards, but there's no set date yet. This is ostensibly a running watch with built-in GPS and a top-end heart rate monitor, as well as battery life that's designed to last for two marathons when using both of those features. If you're not using GPS, you should expect the watch to last for 25 days. 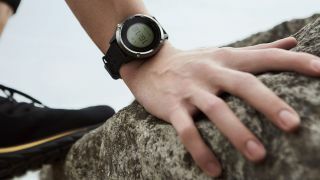 The watch is also water resistant up to 3 meters, but it's not designed specifically for swimming and instead Runtopia recommends this as a feature to avoid damage in the rain. A big selling point comes directly from the Runtopia app. It's an audio coaching feature that should help you on your runs with tips depending on where your heart rate is at pushing you forward or encouraging you to improve in other ways. Exactly how this will work is a little unclear at the moment, but we hope to get one of these watches in for a full review in the near future. Other basic features on the watch include an alarm clock, compass and notifications for a limited number of messages. This isn't a full smartwatch experience though as it won't include full notifications for all of your apps or features like contactless payments. It'll work with any phone sporting Android 4.4 software or above, or any iPhone with iOS 9 or higher running on it.